Wasting $1,000 per Month Might not be much (for some), but Wasting 50% of Budget Is. This is the success story of a local home window repair company that was wasting half of their budget (about $1,000 per month) on PPC with Google Adwords because of an awfully setup campaign. I started working on the project as an SEO expert, but I let the client know I had experience in PPC advertising too and offered them a campaign review. They agreed. As I said, the Google Adwords campaign was set up by a guy who was doing it for the first time; with the assistance of an expert from Google Adwords, by the way. Since I have already done sufficient keyword research, the task should be simple, I thought. However, when I first opened the account, I realized that I would really have to spend a lot of time on fixing and improving everything. Usually, when I review Google Adwords campaigns created by less experienced people, there are only few mistakes. In the case of this local company, almost everything possible was set up the wrong way, with the exception of geo-targeting, though. Note: Just wanted to say a few words on my experience in working with Google Adwords representatives who “help” setup advertising campaigns. So far, I have dealt with three and none of them seemed to care about conversions. Yes, they all recommended adding extensions, adding negative keywords, conversions tracking and such, but so far none of them have ever asked me (or the client) how much the company can spend on getting one client. Again, this is my experience and I can’t speak for all the people working there. So what was wrong with the Adwords campaign? Structure. Since there was no one who could logically group key phrases, I assume that the ad groups were created the way the Google Adwords system recommended. Landing pages. All the ad groups had the same landing pages (website’s homepage). There were no ad extensions at all, no calls tracking and no negative keywords at all. Long story short, it was easier to rebuild the campaign from scratch rather than try to fix the existing one. The worst mistake was that half of the clicks were irrelevant. Where was the leak? Home glass repair is one of the services that my client provides and the thing is that people are in need not only for home glass repair but also for car glass repair services. During 12 months the campaign lost $12,000 because of clicks related to car window repairs. I guess you wonder how it can be that they were still running that Adwords campaign. The answer is pretty simple. The company has been in business for over 8 years and word of mouth marketing brings them clients every day. They didn’t count conversions and treated PPC ads the same way you would treat ads in a local newspaper. They didn’t even realize the money they spend can be connected to the money they earn (or not). You don’t know your numbers. 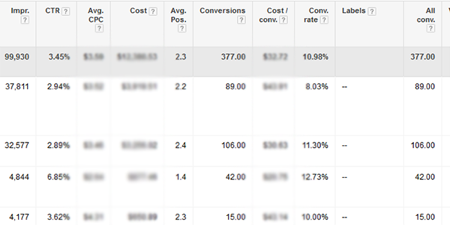 You should track conversions to be able to analyze your PPC ads performance. Wrong landing pages. I have never thought I would even write about it but I realized that it is still an issue. You should land your visitors to the most relevant (relevant to search intent) page of your site. Negative keywords. This process is often time-consuming because “wrong” keywords appear in the reports all the time. You should carefully track the keywords that earned you clicks and impressions and constantly block irrelevant ones. Don’t fight for the #1 spot. You should remember that your primary goal is not to get the first position in the ads block, but to earn money. It can be especially difficult for new accounts (yes, account history matters too) to get to the #1 position. Besides, if your niche is really highly competitive, the cost might be too high to build a profitable campaign. Use the power of geo-targeting. If you offer services across the whole country, people are more likely to click your ad if they see the name of their location in an ad. It is all about psychology. I created separate ad groups of each service area and CTR and conversion rate is really much higher in comparison to ad groups that have no geographical connection. Bid for your own brand name. You should do it especially if your company name is recognized. Did you know that bidding for others’ brands names is illegal in lots of countries? However this doesn’t stop others from doing it. In order to protect your business you should bid for your own name and track your competitors too. So, as you can see I faced a really badly setup campaign. On the one hand I was shocked that they were really running it for more than a year, and on the other I felt inspired because I knew that I would definitely impress the client. I have completely rebuilt 95% of the existing ad groups. I added negative keywords to block budget leaks. Ads extensions were added too (phone number, Google maps, reviews, etc.). We added a Google phone number and set up tracking. Only phone calls that lasted more than 30 seconds are counted as a conversion. At this point I still didn’t have the most important information that would allow me to turn the Google Adwords campaign into a profit-making machine. I still didn’t know how much the client can spend on getting one client. It is must-have knowledge to build a profitable PPC campaign because even with high conversion rates you might be spending too much to actually earn money and be able to grow your business. The reason is pretty simple – some keywords might be too expensive to bid for. In this case, you would need to turn those too expensive keywords off and focus on keywords that will bring you profit (taking into consideration your conversion rate, of course). Unfortunately the client was extremely busy and I didn’t get that information at the early stage. We were planning our talk for about two weeks, but after that I had everything I needed to improve ads performance even more. I am not an expert in window repairs, so I listed several questions about their services. It appeared that they don’t offer certain types of services and do not repair all types of windows. This allowed me to block even more irrelevant search queries. When I was still unaware of how much they can spend on one conversion, my bidding strategy was to keep average CPC not higher than it was before. After I was told the amount, I had to fix lots of things again. As my research and analysis showed, not many home window repair companies were doing SEO, so PPC competition for the most popular key words was really high. In addition to that, replacement windows and car window repair companies (not our competitors) were bidding for the same key terms as we did. I also added about 30 other areas where my client offered their services. Predictably average CPC in these ad groups was much higher, but CTR and conversion rates were much higher too. 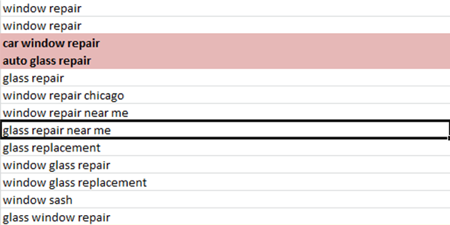 In order to be able to do a good performance analysis, I created a separate label which allows showing data for chosen ad groups only. Note: Those extra local ads gave me really valuable data about service demands in particular areas. It opened new opportunities in search engine optimization too. For me, a PPC expert, this campaign was technically pretty simple. The hardest work here was to get the necessary information from the client. It was also very important to learn everything about the client’s business. Home window repairs appeared way too complicated than I thought it would be. When I realized that the campaign performs excellently I recommended the client to increase the daily budget three times. They were a bit worried to spend $240 a day, so we agreed to $200. In a week, the client called me and asked to decrease the daily budget to the previous amount, because they scheduled appointments for three weeks ahead and at that moment they couldn’t handle all the volume of incoming orders. and have a person who can set up your Google Adwords campaign properly.